Ireland Ways communication before departure was excellent. Dingle Way walk amazing with great accommodation and Irish always extremely welcoming and friendly. After a tough last day walking Clochan - Castlegregory to have the lovely Annette pick us up and take us to her BnB - The Shores Country House - wow, what a treat and a magnificent home. Would highly recommend this walk. Loved Ireland and it's people - can't wait to go back! The town’s most famous resident is a bottle nose dolphin named Fungi who made Dingle harbour his home in 1983. The terrain of the The Dingle Way is greatly varied from rural roads to coastal paths and low level mountain trails, accessible to all levels of fitness but, with a little tweaking (shortening the walking distance some days) it could be perfect for families also. From Tralee to Dingle, you will be following the trail known as the Kerry Camino, enjoying fantastic views of the ocean and Inch Strand home to one of our favourite beaches. 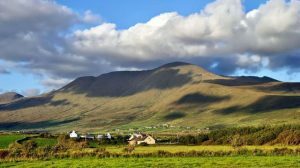 The route passes through Gaeltacht areas (Irish-Speaking region), making it a wonderful place to discover authentic Irish culture, music and entertainment. From Dingle you can then continue along The Dingle Way, hiking one of Ireland’s most scenic regions: the Dingle Peninsula. This route has many 5 star reviews. Home to stunning landscapes, The Dingle Way is also full of important cultural and historic sights from Celtic Ogham stones to Fahan Beehive huts, ring forts and dolmens, standing stones, holy wells… Another place you shouldn’t miss is the village of Annascaul, birthplace of famous Antarctic explorer Tom Crean (1877-1938). 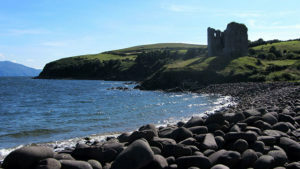 You can learn more about the Dingle Way route in our blog. 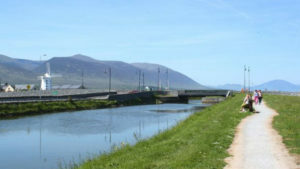 The Kerry Camino is a short break from Tralee to Dingle which travels along the same route as the Dingle Way. 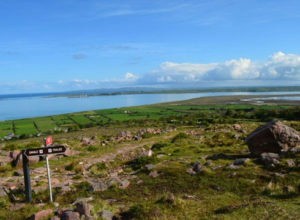 Have a look at our Kerry Camino package here. If you are starting the Dingle way from the village of Camp you will have a short transfer to the village of Camp after breakfast (the transfer is not included but there are regular buses to Camp). The walk from Camp to Annascaul is very gentle, predominately along quiet boreens which wind through the countryside, offering views of the mountains and the North Atlantic ocean. When you reach Annascaul you can take a walk on Inch Beach. 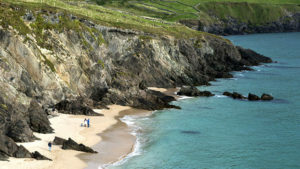 This is one of the longest beaches on the Wild Atlantic Way and offers stunning views of the surrounding mountains. Today is a long day walking along rural roads and coastal tracks until you turn inland, gradually gaining altitude as you climb. After turning back on yourself it is all down hill to the picturesque fishing village of Dingle. This is one of the top villages to visit along the Wild Atlantic Way route. There are plenty of cafes, pubs, restaurants and other places of interest to explore. You can add an extra day to your itinerary, allowing yourself a sleep in and late breakfast before taking a day off your trek to arrange a boat tour to The Great Blasket Island. 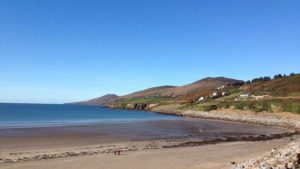 The highlights of this area include a boat tour of Dingle Harbour, dive/swim with Fungi the dolphin, drop in to see the good work being done at the Dingle wild life and seal sanctuary. Try horse trekking on either mountain trails or sandy beaches, feeling energetic and adventurous? visit Irelands largest indoor climbing wall or just enjoy a day off to relax and explore the town at your leisure. Dingle is the end of the The Kerry Camino. A fantastic days walking on a mixture of boreens and coastal paths on The Dingle Way today. You will have the best views of The Great Blasket Islands and this dramatic coastline of the Wild Atlantic Way. 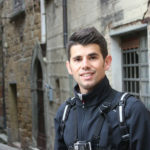 In either good or bad weather experiencing the landscape and scenery will be breath taking. Extra day- Add an extra day to your itinerary, allowing yourself a sleep in and late breakfast before taking a day off your trek to arrange a boat tour to The Great Blasket Island (weather dependent). 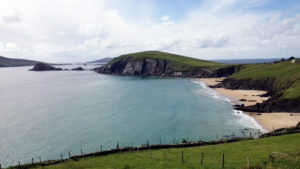 Todays route on The Dingle Way will lead you on a mixture of boreens, coastal paths and beaches along headlands, peninsulas and secluded coves. This section has plenty of little side tracks to beauty spots and historical sites. It is definitely worth your while familiarizing yourself with some of the local points of interest to make sure you get the most from your time in this historic area. If the weather is favourable why not have a picnic by the monument at Fort del Oro or visit the beach. Turning inland once more and gaining altitude as you walk in the foothills of Brandon mountain (this will be the highest point on your trip), you will be walking along mountain trails as you descend and enter the Brandon Head nature reserve, best known for its blanket bogs and heather. You can follow the trail to the viewing point at Brandon Point. From there you will moving back on boreens, looking down onto Ladys Island and Illanduff. Cloghane is the end of our Highlights tour. A long day ahead of you on this section of the Wild Atlantic Way but the very mild ascent and decent will help it feel shorter. 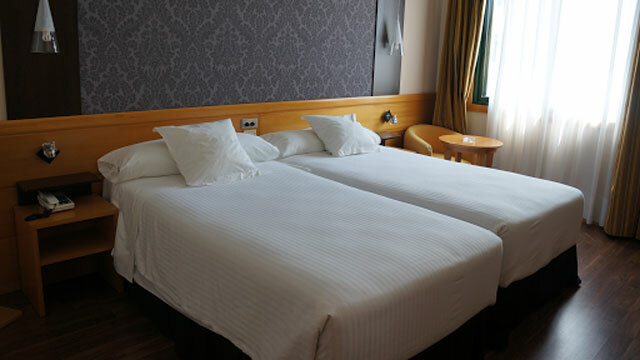 You will spend a larger part of the day walking along beaches and coastal trails. This section of The Dingle Way, like some of the others is dotted with great picnic spots. If you have a packed lunch with you, you can just have a picnic on the beach. If not there are a few cafes and restaurants in the villages of Faramore and Kilshannig. 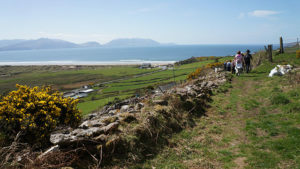 Your last day on The Dingle Way is long, however relatively flat, with stunning coastal views of the bay of Tralee. You will be walking along rural roads and coastal trails before taking on a low level mountain trail on your walk back into Tralee. Alternatively, if you want to have a more relaxed day, you can catch a bus or taxi from the village of Camp (11km).